Photographs very kindly provided by Caroline Hedengren-Dillon. Click on the pictures to enlarge them. Text and formatting by Jacqueline Banerjee. Chateau de Vaux-sur-Seine, France, front elevation. Only twenty miles or so from Paris, the small town of Vaux lies in the beautiful valley of the Seine. The history of the castle there goes back to the fifteenth century, when Louis XI (1423-1483) gave the land to his favourite, Olivier Le Daim. The Comte de Meulan, as Le Daim became known, set out to establish himself there in some style. Over the years, the building has had the usual history of alterations and extensions, very much as happened in the great country estates of Britain, especially during the nineteenth century. Nevertheless, the castle's distinctive round towers and the core of the building have remained intact. The round towers were just the features that British architects like William Burges admired so much on their visits to France, and strove to emulate (see for example Burges's own Tower House in London). The Piedmontese Vincent Marochetti acquired the castle in 1819. His son Carlo, the sculptor, inherited it after his father's death in 1822, and it remained his base in France even though he spent a good deal of his time in England. After he died in Paris in 1867, Marochetti's body was brought back and buried in the churchyard of the local church. Rear of castle. Surrounded by lovely scenery outside, "Castello Marochetti" has yellow stone walls that have weathered romantically over the centuries. It is equally atmospheric inside, and even has some delightful sixteenth-century stained glass. Marochetti's descendants continue to live here, and are now lovingly restoring it. The castle has recently been granted a red plaque (similar to the familiar blue plaque here), to celebrate its connection with their famous forebear. "Le Chateau de Vaux-sur-Seine" Ville de Vaux-sur-Seine. Web. 18 October 2012. 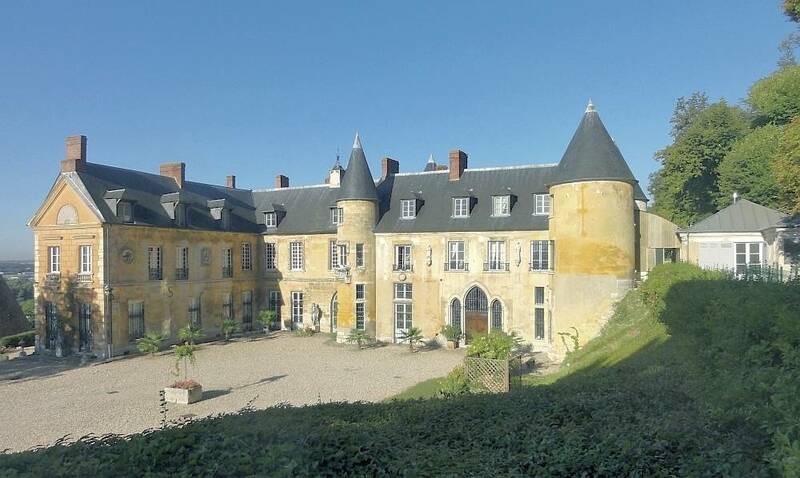 "Monuments Historique: Chateau de Vaux" (French historic buildings listing). Web. 18 October 2012.